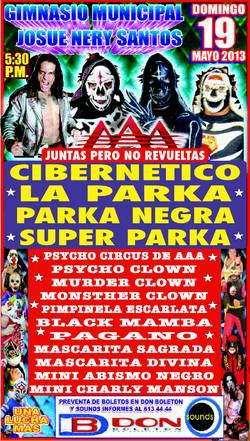 5) Gronda II & La Parka Jr. vs Ángel Metálico & Pentagón Jr.
1) Drago, El Elegido, Fénix vs ?, Pasion Kristal, Pentagón Jr.
2) Lucky Boy & Niño de Ébano vs Apolo Estrada Jr. & Carta Brava Jr.
5) Cibernético, Electroshock, La Parka vs el Hijo del Perro Aguayo, Máscara Año 2000 Jr., Texano Jr.
2) Demoledor, Golden Boy, Lucero Jr. vs Full Back Jr., Guerrero Místico, Guerrero Mistico Jr.
No Freelance or Segura. Two Spanish Flys from Maxima Velocidad for the win. Axel's debut in AAA (though he was in AAA as Goldman way back in 1993.) Apache beat Atomic Boy with a top rope powerbomb. Daga made fun of Axel after the match. Chessman beat Drago with a top rope legdrop. Rolling with the momentum of such a big win, Chessman challenged Texano for a title shot. Texano again said Heavy Metal is washed up as a luchador, so no title match for Heavy Metal. Texano ruled Chessman was a quality luchador who give him a good fight, and so accepted Chessman's challenge. Villano IV snuck in a foul on Psycho Clown. Villano IV declared he and his brothers were the best trio that has ever existed in the history of wrestling. La Parka (not the Clowns, who are champions here) appeared to disagree and proposed an AAA Legends vs Villano's team. As with all Perro matches, an unannounced no disqualification match. Perro said this result would repeat at TripleMania. Canek Jr. turned on his partners. Perro foul for a DQ. added dark match. Saturno & Fresero Jr's debuts in AAA, Mortal's first TV match in over a year. Jinzo won via 450 splash. Pepe Casas was honored for his 80th birthday by Joaquin and Heavy Metal before the match. Dinastia beat Argos in the match. Porra Fresa says this was the best match of the night. Faby Apache german suplexes Hechicera for the win. Ricky Marvin was the mystery Perro. The Perros mocked the Mirreyes with their own MiPerros gimmick. Perros martineted Toscano, who was strechered out. Perros were DQed for excessive violence. Texano hit Heavy Metal with a guitar, giving Chessman the win. Parka and Parka Negra feuded. Blue Demon Jr. & Mesias did not get along, but their team won when Chessman attacked Texano. Chessman explained the megachampion has no friends and he was taking the title at TripleMania. Demon and Mesias fought after the match, with Fenix, Axel and Parka breaking it up. Porra Fresa said this was the worst match of the night. Murcy kept his title when New Fire fouled him. Supposed to a tag match with Mascarita Divina, turned into a title defense against Chessman & Psicosis. Dinastia kept his title. Rudos snuck in a foul on Chessman. 4) Electroshock & Heavy Metal vs Máscara Año 2000 Jr. & Texano Jr.
2) Lobo Solitario Jr. & Pegasso De Plata Jr. b Ataque 77 & Reo Jr.
4) El Mesías, Jack Evans, Octagón vs Máscara Año 2000 Jr., Silver Kain, Texano Jr.
Segura and Freelance made it this week! Saturno & Eita making their debuts. Segura was last on a main AAA taping in August of 1997. Faby pinned Charly with a Tiger suplex. Said to be a very good match. Jack beat Crazy with a 630 senton. Fenix won it for his team, only for Villano V to run in and help the rudos beat up the tecnicos after the match. V5 said his El Toreo team was ready for Parka, Octagon and Electroshock (apparent third man), but did not reveal his partners. Parka ran in and attacked Villano IV, setting up the Psycho Clown frog splash and win. Seconds were Daga and Escoria, but both were knocked out. Cibernetico beat Perro with a chokeslam onto chairs. Joaquin and Konnan came to the ring after the match, Perro demanded another fall, but Joaquin said he must wait until TripleMania. 5) Chicano, Silver Kain, Silver King Jr. b Bachiller, Electroshock, Espanto Jr.
4) Cibernético, El Mesías, La Parka vs Gronda, Parka Negra, Texano Jr.
Maiden - who is not Raider - replaced Marabunta Jr. Match changed around, with Octagon missing. Octagon relaced Mil Mascaras, who appeared in gear but did not wrestle. Tecnicos took the first, rudos took the second. In the third, the lights went out, a bunch of mystery men in black attacked everyone, and Mil Mascaras, Blue Demon and Tinieblas made the save. Carta Brava & Eterno made it over here instead of IWRG. Danny Casas and Gotita de Plata's debut. Chica Ye-ye, who had been in last year's QPPLC, debuted here. Yuriko pinned him with a German suplex for the win. Divina beat Manson for the win. Uro Rocker replaced Machine Rocker, a tragic change. Especially for Alebrije and Cuije - Uro sat on them both for the win. Psicosis beat Crazy Boy with a super Arabian facebuster, but the Perros kept beat up the tecnicos and Piero called for an excessive violence DQ. Psicosis couldn't believe such a thing and complained he was robbed of a win. Mesias splashed Parka Negra for the clean pin. Ultimo Gladiador replaced Eterno. Maxima Velocida beat Carta Brava with a two man Spanish Fly. Faby submitted Mary for the win. Taya powerbombed Faby after the match, and said she'd beat her at TripleMaia. Daga beat Axel with a top rope Destroyer. Axel was strechered out - until Daga knocked him off the stretcher. Apache unmasked Atomic Boy after the match. Jack beat Fenix with his 630 senton in a good match. Money thrown in the ring. Metal pinned Texano with a casita. the 'surprise' return of Dr. Wagner Jr. He feuded with Canek, and Canek took Wagner's mask and pinned him to win the match. The two teased a mask vs mask match. Event Notes: The show began with a tribute to Hector Garza. Perro Aguayo dedicated his TripleMania match to him, and wrote his name on his wrist tape. Many of the luchadors wore purple armbands in honor of Hector Garza. 5) Monsther Clown, Murder Clown, Psycho Clown vs Argos, Drago, Pentagón Jr.